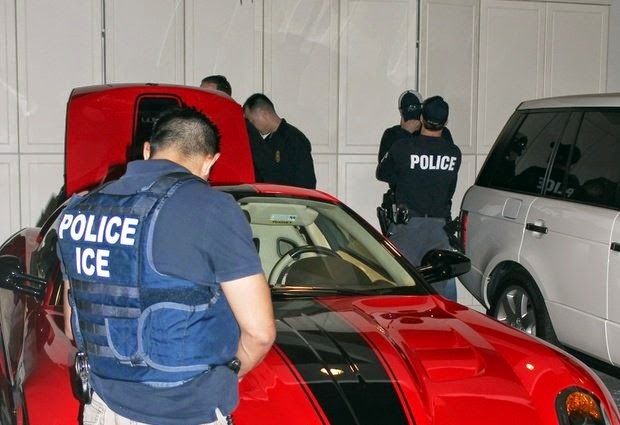 Provided by U.S. Immigration and Customs Enforcement (ICE), agents inspect a Ferrari at the Malibu, Calif., mansion of the son of Equitorial Guinea's president, Teodoro Nguema Obiang Mangue, during the execution of a search warrant. Mangue must sell the $30 million Malibu mansion, the Ferrari and Michael Jackson memorabilia and then give the proceeds to the citizens of his impoverished country, under a settlement announced Friday, Oct. 10, 2014 by U.S. authorities who said he bought the lavish items with money stolen from the African nation. Mangue, who is also Equatorial Guinea's second vice president, agreed to turn over $20 million from the sale of these assets to a charitable organization to be used to benefit the people of his country, the U.S. Department of Justice said. Another $10.3 million will be forfeited to the U.S. government. JOHANNESBURG (AP) — A U.S. deal forcing the son of Equatorial Guinea's leader to turn over $31.3 million in ill-gotten gains misses an opportunity to expose the workings of corruption in the oil-rich nation, human rights activists said. The Open Society Justice Initiative said putting Teodorin Nguema Obiang Mangue on trial would have brought "revelations that ... could have been of inestimable value to expose the nature of the corruption system in Equatorial Guinea as well as the role of lawyers, bankers and other professionals who grease the wheels of abuse." Obiang is also the country's vice president. Still, the New York-based organization welcomed the first U.S. legal action of its kind to target the family of a sitting head of state, according to a statement late Friday by Ken Hurwitz, head of the organization's anti-corruption work. In the first case under the Department of Justice's Kleptocracy Asset Recovery Initiative, Obiang must sell a Malibu mansion, a Ferrari and Michael Jackson memorabilia to raise $20 million to go to a charity working for the people of his country and $10.3 million to the U.S. also to be used to benefit the people of the West African coastal nation. He also must pay $1 million to cover the value of Michael Jackson memorabilia already removed from the U.S., including a "Thriller" jacket and crystal-covered glove, Assistant Attorney General Leslie Caldwell said Friday. The U.S. had in 2011 filed claims against Obiang's U.S.-based assets worth more than $70 million, alleging they were the proceeds of corruption. It said Obiang's annual salary at the time was less than $100,000. Hurwitz said the case significantly "breaks with the more common pattern of waiting until a corrupt family's rule has ended before tracking down their assets: in contrast, Teodorin's family is still very much in control in oil-rich Equatorial Guinea, most of whose oil and gas is pumped by U.S. companies." Despite wealth that has raised Equatorial Guinea's per capita income above that of former colonizer Spain, most of the 750,000 people live in poverty. U.S. authorities say Obiang other officials have amassed vast wealth through extortion, embezzlement and other corruption. Obiang said in a statement that he was pleased to end the proceedings, even though his property "was acquired with funds earned in accordance with the laws of my country." He said he hoped the settlement would improve relations, adding "For the good of my country, it was important to resolve this matter and put the relationship back on firm footing." Obiang still is the subject of lawsuits in France and Spain. French financial prosecutors in March filed preliminary charges of alleged money-laundering connected to real estate, luxury cars, art and other property in France. It is part of a larger suit involving properties owned by leaders of Equatorial Guinea, Gabon and Republic of Congo. In Spain, prosecutors in 2009 opened an official investigation into alleged money-laundering by Equatorial Guinea's president, Teodoro Obiang Nguema, and his family into bank transfers and the purchase of luxury properties in Madrid, Gijon and the Canary Islands. Provided by U.S. Immigration and Customs Enforcement (ICE) shows the exterior of the Malibu, Calif., mansion of the son of Equitorial Guinea's president, Teodoro Nguema Obiang Mangue, during the execution of a search warrant. Mangue must sell the $30 million Malibu mansion, a Ferrari and Michael Jackson memorabilia and then give the proceeds to the citizens of his impoverished country, under a settlement announced Friday, Oct. 10, 2014 by U.S. authorities who said he bought the lavish items with money stolen from the African nation. Mangue, who is also Equatorial Guinea's second vice president, agreed to turn over $20 million from the sale of these assets to a charitable organization to be used to benefit the people of his country, the U.S. Department of Justice said. Another $10.3 million will be forfeited to the U.S. government.